I've done some google searches, but I haven't been able to find anything like this. 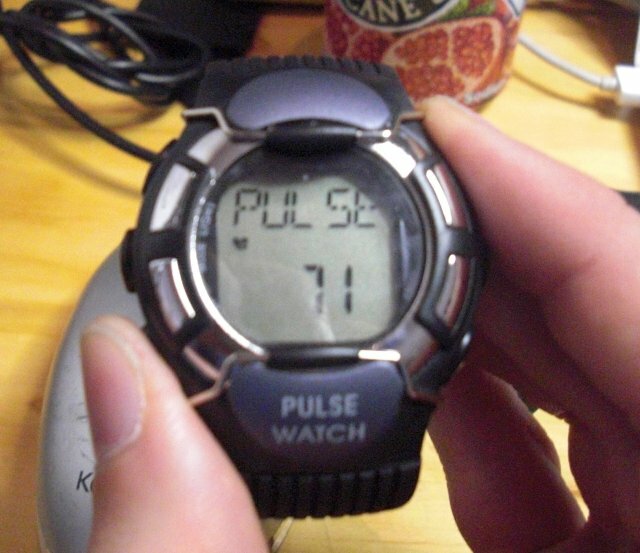 There are some pulse-sensing watches, for instance [http://www.chinavasion.com/product_info.php/pName/exercise-watch-pulse-calorie-reader/ Chinavasion: Exercise Watch - pulse + calorie reader] or see some reviews at [http://www.consumersearch.com/heart-rate-monitors Heart Rate Monitors]. These devices almost universally have a small display, but I think a haptic solution could be greatly superior.